For reasons born in my misspent youth I have a personal rule to never pass by a pub with "Wellington" in the name, or allusions to the man such as 'Iron Duke", or his most famous battle. So I entered this place and bought a pint of something called Harvest Pale Ale (2.90, and quite nice). Nothing stood out as noteworthy, but I've ticked off another Wello. Very friendly barmaid who served up a well-kept pint of Bass against a backdrop of pictures of women drinking massive glasses of beer. Tried to enjoy the eclectic mix of music (from the Small Faces to Arcade Fire) but struggled to hear it above the racket created by half a dozen Geordies talking shite about football. Stayed for a while but never found out who sits in in the very low chair. 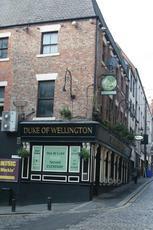 The Duke has been recently refurbished and given a good clean. The beer is ok, but they need to make the supply more consistent. Sometimes there's four beers on othertimes none. Had three different managers last year. It's not the manager, it's the pub. It stinks. Beer is very good as is the choice, but the place needs a little love. Close it for week; clean it; paint (then clean it again); make the toilet usable; clean the cellar. The current barmaid, btw, is seriously hot. Very friendly pub, beer maybe not the best but nothing to complain about either.